Handmade Style by Anna Graham is a great book with lots of drool-worthy projects. I've checked it out of the library a few times and now it has a spot on my Christmas list. I chose to utilize the pattern "picnic plaid quilt" for making a quilt for my friend's baby boy, Max. Max's mom, Laurel, is a friend I met through the Front Range Modern Guild. I decided to go with a "space" theme for the focus fabrics and worked really hard to follow the pattern instructions to use dark, medium, and light value fabrics. 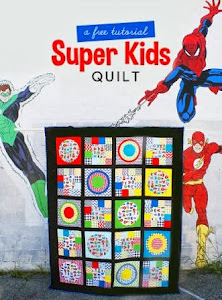 I did all of the cutting for this quilt when we were snowed in by a snowstorm that closed school and the Air Force base where my husband works (it was heaven to have everyone home!). I have zero white/cream in my stash but soon settled on a navy pin dot - I think the print was a better option in the end - which makes me happy. It took a little courage to use some of my Lizzy House Constellations but it's so perfect for this project. (The other fabrics are from Rocket Age by October Afternoon, Lizzy House Pearl Bracelets, and the light blue star is a find from Marden's ages ago). For quilting, I settled on simple stippling. alternating thread colors to match the fabrics of the quilt top. When I use all prints in a quilt, I don't feel too guilty when I do a simple meander stitch, as the fabrics are so busy and intense quilting wouldn't show up very well. I used random stuff from my stash to complete the backing and bound the quilt in a simple dot fabric. I machine bound it entirely- mainly to save time but also in the interest of durability. The link up is about 10 days away away but I wanted to post this early anyhow to really feel "done" with this project. Le Challenge's theme is the word "space" and as you can see, I took it very literally. Thanks for the inspiration as always! This is so adorable! 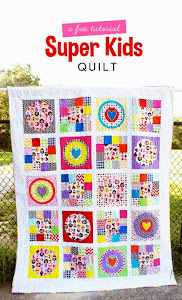 I love the pin dot, it works so well, and it's a great mix of fabrics. I'm sure your friend and her son will love it! I'm definitely going to try and cut up all the fabrics I love, it's much more satisfying to use them. Thanks for linking up to le challenge! Very cool quilt for the space challenge! I would love to find some of that print you used for the backing too! I love it, it came out great! I love Anna's book too, I keep getting it out and wanting to make a bag from it and something mundane comes along and needs to be made! Space and time I need both. I love your quilt - that retro Space fabric is awesome!